FRIEND AND CO.: HEAD ART SHOW! 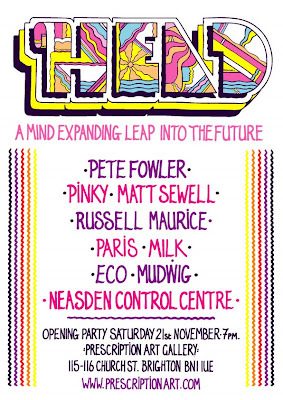 Pete Fowler, Matt Sewell, Pinkyvision, Russell Maurice, Dan Mudwig, Neasden Control Centre, Milk, Paris and Eco. Well established but distinctly avant-garde these Artists share a vision of the modern world that is abstract, colourful, esoteric, cartoonish, surreal and challenging. Each shares an ability to reflect the joy and celebrate the strange, to capture who we are and where we’re going and to keep moving forward. Join us at Brighton’s biggest and best new Gallery - Prescription Art - for a revolution in the Head – for paintings, murals, prints, live art, installations, ideas, conversations and nu-psychedelic sounds. The Future is coming – Be Ready.